Introduction: The widespread use of direct oral anticoagulants (DOACs) has been increasing the conditions in which emergency physicians are forced to rapidly reverse anticoagulation in case of life-threatening bleeding or need of urgent surgery or invasive procedures. The recent approval of Idarucizumab, a humanized monoclonal antibody fragment (Fab), offered the opportunity to rapidly and safely neutralize the anticoagulant effect of Dabigatran. However, real-world experience of its effective use in different emergency setting is now required. Lumbar Puncture (LP) is recognized as an invasive procedure at major bleeding risk and is, therefore, contraindicated in anticoagulated patients. 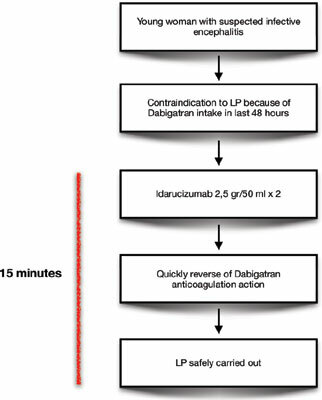 Conclusion: We report a successful use of Idarucizumab in an emergency LP of a young woman with a possible diagnosis of encephalitis and a previous history of venous thromboembolism on long-term treatment with Dabigatran 150 mg twice a day. Direct oral anticoagulants reversal, idarucizumab, dabigatran, emergency lumbar puncture, urgent invasive procedures, emergency department.